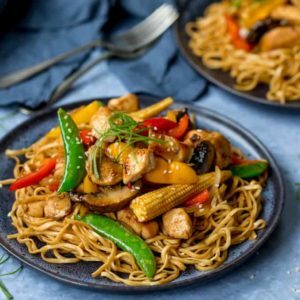 Stir fries are such a great way to use up the veggies in the fridge and get dinner on the table in ultra-quick time. The first thing the kids ask when the get home from school is ‘Can I have a snaaaaack?’. 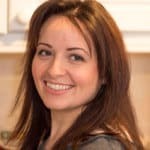 Let them have a snack out of the snack cupboard (crackers/snack bar/leftover slice of cake from a blog recipe) and risk them not being hungry enough come dinner time. Give them a piece of fruit, ignore their protests that they’re ‘starving’ and all enjoy dinner together. Get dinner on the table in super-quick time (especially if they’ve got an activity on in the evening as they do a couple of times a week). 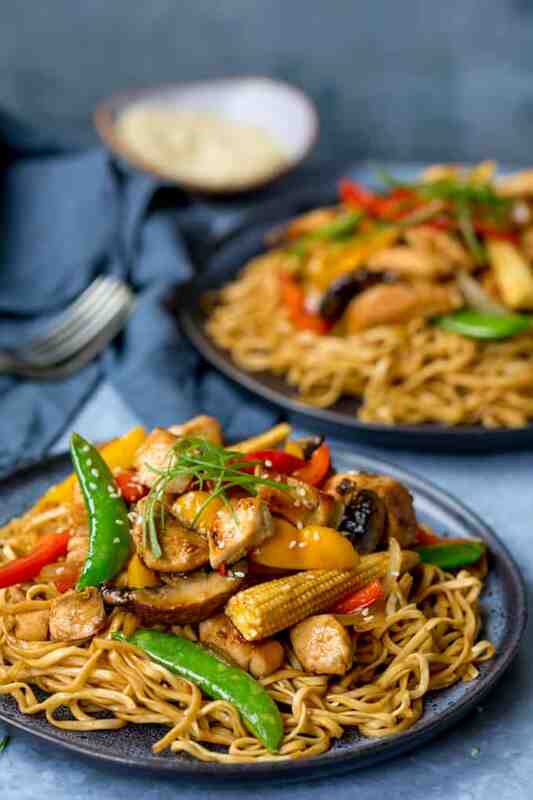 This stir fry is great when you’re in super-quick mode, and will have everyone happy and satisfied in no time. 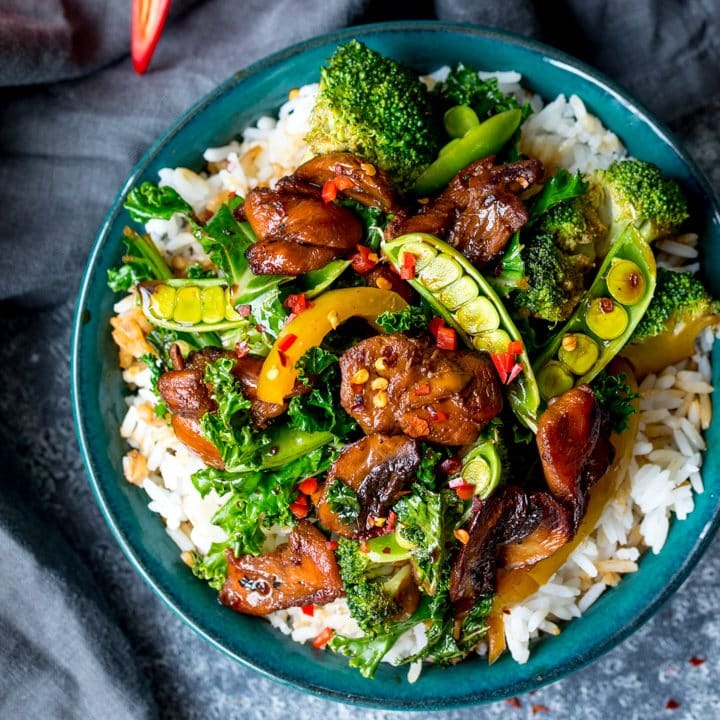 I’ll often cook up a pan of boiled rice to go with a stir fry (I get the rice going, and then the challenge is to get the rest of the stir fry done by the time the rice is ready). 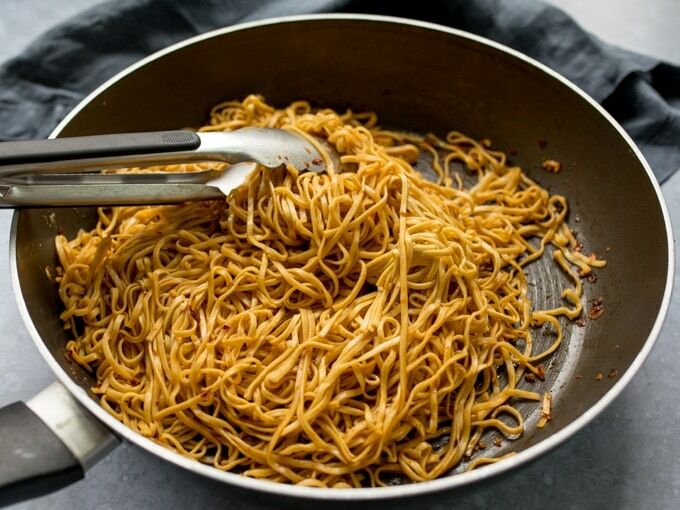 This time I fancied some noodles – spicy Asian egg noodles. Just as quick to throw together. First put your noodles on to boil, then start browning the chicken. I like to use big pieces of onion in this stir-fry so you get the crunch. The noodles only take few minutes to boil. So once they’re done, drain them and fry them up with sesame oil, garlic, chilli flakes, ginger, soy sauce and a little light brown sugar. 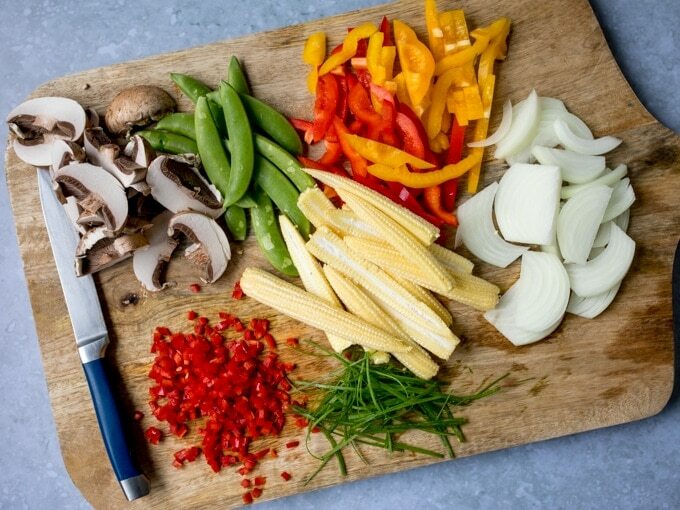 Back to the stir fry – add in veggies such as baby corn, sugarsnap peas, peppers, mushrooms and bamboo shoots or water chestnuts. Once they’re warmed through, add in Lee Kum Kee Honey & Soy stir fry sauce. It will add a lovely reddish-golden colour to the stir fry. 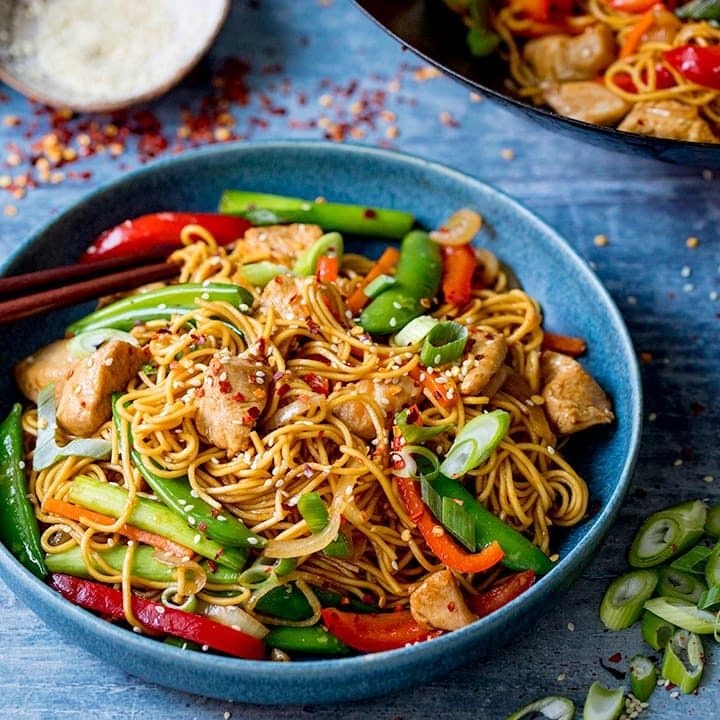 Serve the stir fry and noodles up with a sprinkling of sesame seeds and spring onions. Quicker, tastier and way cheaper than ordering that takeaway! Unfortunately, the honey and soy stir fry sauce isn’t gluten free. Lee Kum Kee do a good GF Oyster sauce though. Use that with garlic, ginger, a splash of their GF soy sauce and some GF sweet chilli sauce for a great alternative. 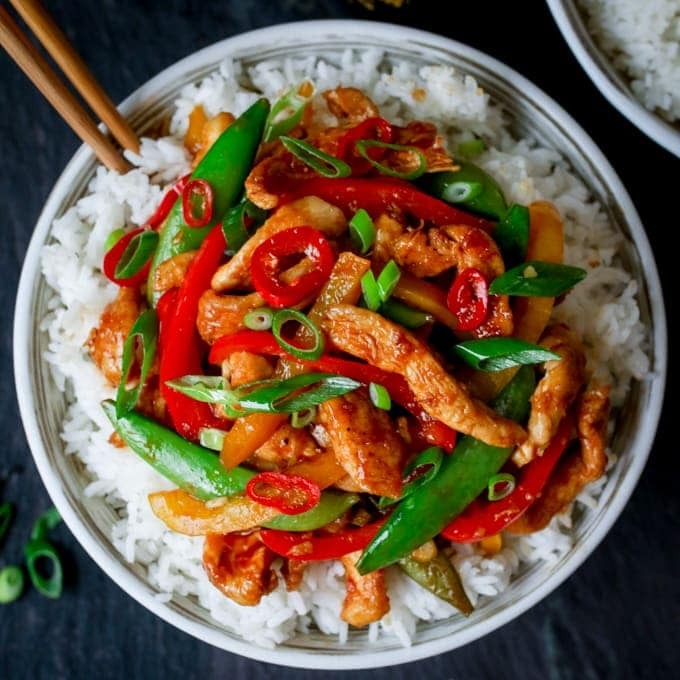 Stir fry tastes so much better when eaten right away, so I’d recommend not making it ahead. However, you can chop the veggies and refrigerate. Also cook the noodles ahead, then drain them, run under cold water to stop the cooking process and toss with a teaspoon of sesame oil. Then cover and refrigerate. These can then be stir fried just before you eat. Yes, you can leave out the chicken entirely. I’d add extra mushrooms (a couple of different varieties) too. You could also add tofu or quorn pieces. Lee Kum Kee have a huge variety of stir fry sauce, but my other favourites are Black Bean & Garlic, Tomato & Garlic, and Kung Pao. Start by boiling the noodles as per the pack instructions, then drain and run under cold water until the noodles are cold (this will prevent the noodles sticking together). Stir through ½ tbsp of the sesame oil and put to one side. 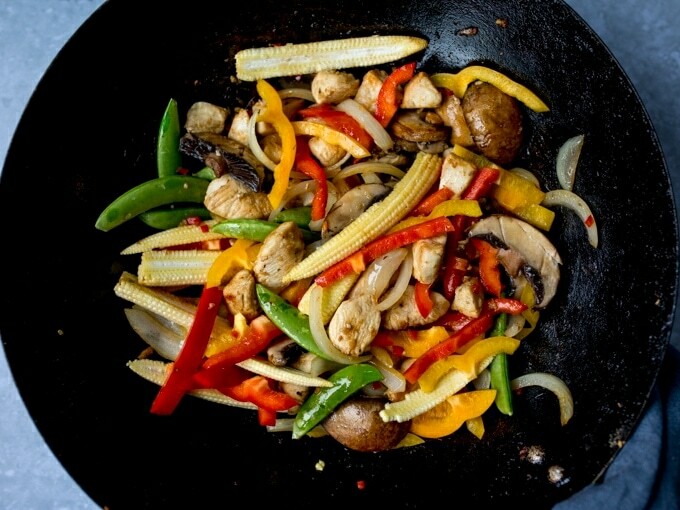 Heat the vegetable oil in a wok or large frying pan (skillet). Add the chopped chicken and fry until lightly browned all over (about 5 minutes). 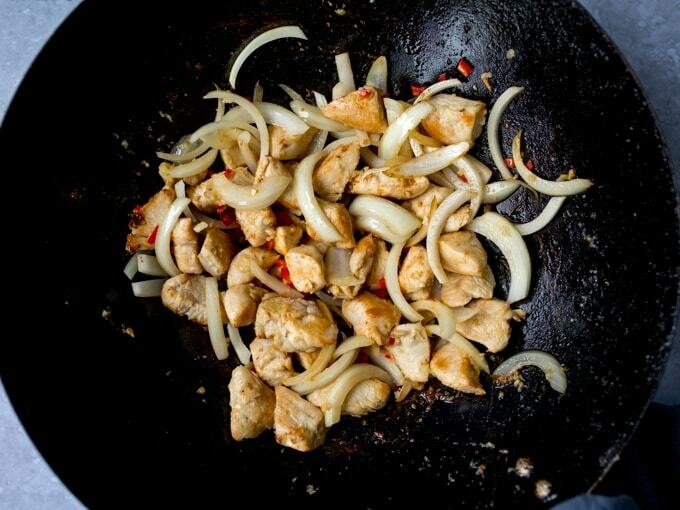 Add the garlic, ginger, chilli and onion and cook for a 3 minutes – until the onion has softened slightly. 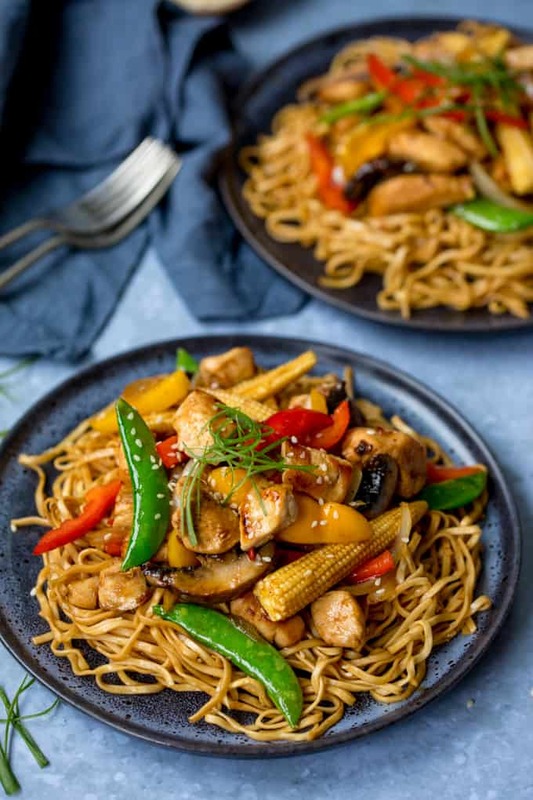 Add the mushrooms and cook for a minute, then add the yellow pepper, red pepper, baby corn, sugarsnap peas and bamboo shoots. Stir fry together to 3-4 minutes, stirring regularly until hot throughout. Meanwhile, continue with the Asian noodles. 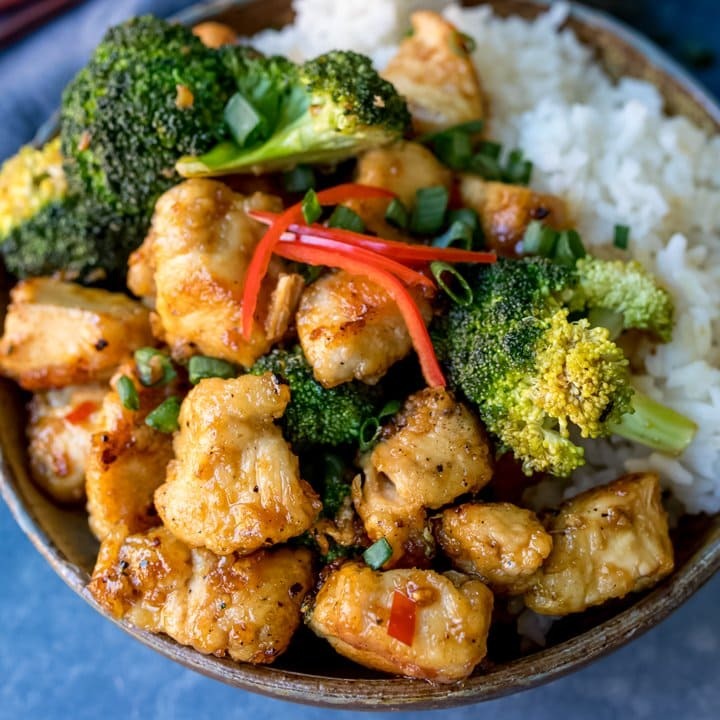 Heat the remaining sesame oil in a wok or large frying pan (skillet) over a medium heat. Add the garlic, ginger and chilli flakes and cook for 30 seconds or so, until they release their fragrance. Add the soy sauce and sugar, stir, then add the cooked noodles. Continue to heat, stirring often for 3-4 minutes until hot throughout. Turn off the heat. By now the stir-fried chicken and vegetables should be cooked through. 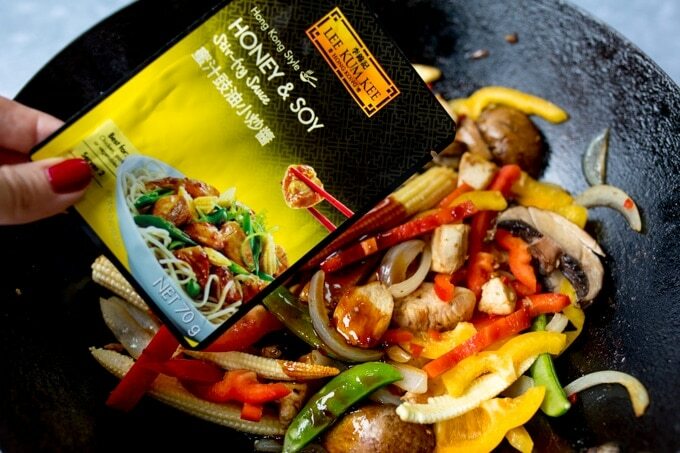 Add the Lee Kum Kee Honey and Soy Stir Fry Sauce and stir through with a splash of water. Heat for 2 minutes, then serve with the Asian noodles, topped with spring onions (scallions) and sesame seeds. Will try this tonight for dinner,looks good,thanks. Thanks Nicky, I was just wondering what to have for tea when this appeared in my inbox. Love Lee Kum Kee stir fry sauces, off to the shops. Excellent Friday Night Supper.